Interior design drawing tools and color wheels are the basis for any good design project. Like a cook needs a spatula or a surgeon needs a scalpel, an interior designer needs their tools at their fingertips to do their job effectively. Find out how these interior design essentials fit into any design project. Interior design drawing tools and color wheels each have importance in different parts of the design process; the drawing tools come in at the early stages of planning and the color wheels come in when it is time to put everything into action. Interior design drawing tools can take several forms. Some drawing tools are for hand drawing and sketching of rooms and ideas, and other interior design drawing tools are software programs that help designers get a different perspective on their design ideas. It helps to have knowledge of technical drawing and drafting before you tackle a free-hand design drawing project, so you understand how to correctly gauge things like single point perspective and projection lines, but there are guides online you can follow if you are new to interior design that will help you get an adequate sketch going. Computer drawing programs, some using CAD and some designed for novice designers, are the wave of the future when it comes to interior design drawing tools. These computer programs allow you to use 3-D drawing techniques to take the guesswork out of your plans. They can also help you with perspective, proportion and balance. On a color wheel, colors that sit across from each other are complimentary colors that blend well together while offering a touch of contrast. Colors that are next to each other on the wheel are called analogous colors. Analogous colors can work well together, but they offer less "pop" and contrast than complementary colors. Triad colors are three colors that form a triangle on a color wheel. Triad colors are a great way for choosing you main colors plus the colors you want to incorporate into your room for those "splashes" of color that bring the room to life. Color wheels have obvious uses for interior designers, and they are relatively easy for a DIY interior designer to use as well. The wheel can be used in every step of putting a room together; it can be consulted over for everything from paint and wallpaper to upholstery, rugs, pillows, curtains, and accessories. Color is considered to be one of the most important factors that determines the overall feel and mood of a room, and in fact, each color is said to have its own meaning. 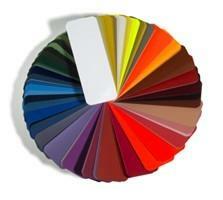 Getting the color right will make or break any interior design project. The tools you need for your interior design project can be found in most art stores and hardware/home improvement stores.